The gospel text for today is Matthew 21:33-46. In order to honor the Sabbath I am keeping this post deliberately short. Today I ask only a question that I keep asking myself all day. 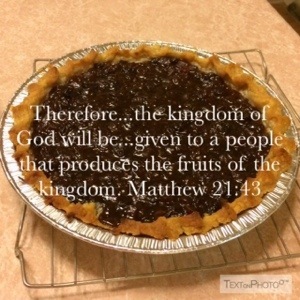 Am I producing and sharing the fruit of the Kingdom of God? I am planning my pies for the big, annual Church supper later this month. Here is a picture of last year’s mincemeat pie.